Authors: S. L. Finkelstein et al. When astronomers observe a distant galaxy, they are seeing the galaxy as it was when the light first left the object, providing a direct glimpse into the past. This fact offers a unique opportunity for astronomers to learn about the early universe and how galaxies like our own Milky Way came to form. Not surprisingly, there are many ongoing efforts to search for more distant galaxies, which can provide a window into earlier epochs in the Universe’s history. 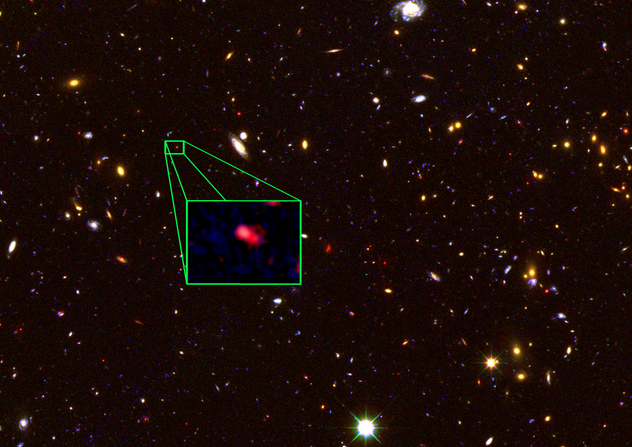 The authors of this work report the discovery of the most distant, confirmed galaxy found to date, known as z8-GND-5296, which presently lies about 30 billion light years from Earth. Here on Earth, we’re seeing what the galaxy looked like only 700 million years after the Big Bang; a mere 5% of the Universe’s current age of 13.8 billion years. The authors’ search for extremely distant galaxies began by identifying potential candidates from the over 100,000 galaxies observed by the Hubble Space Telescope as part of the Cosmic Assembly Near-infrared Deep Extragalactic Legacy Survey (CANDELS). The candidate galaxies were chosen using their colors in the Hubble images, but unfortunately, this method can often mistakenly select closer objects that are masquerading as distant galaxies. In order to obtain a robust distance to each galaxy, the authors used the Keck Telescope to measure each galaxy’s spectrum: the wavelength distribution of the galaxy’s light. Specifically, the authors attempted to measure the amount of emission at the wavelength corresponding to the Lyman-α transition of neutral hydrogen, which is often found to be large for these distant galaxies. The transition occurs when a hydrogen atom’s electron falls from the first excited state to the ground state, which leads to the emission of a photon with a wavelength of 1216 angstroms. However, the Lyman-α emission will not be observed at 1216 angstroms for these distant galaxies but at longer wavelengths. This effect, known as redshift, is caused by the expansion of the Universe, which stretches the wavelength of light as it journeys to the Earth. By measuring how much each spectrum has shifted to longer wavelengths, the authors were able to precisely determine the distance to each galaxy. 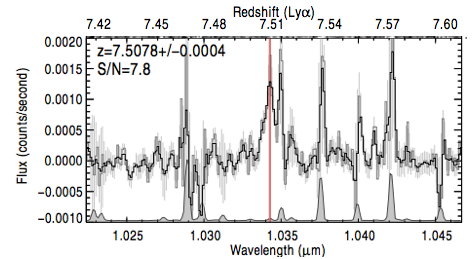 The authors’ measured spectrum for z8-GND-5296 (see the figure below) yielded a redshift of z = 7.51, which overtakes the previous spectroscopic record-holder of z = 7.2. From the spectrum, the authors were also able to determine that the galaxy is forming stars at an extremely high rate, about 330 solar masses every year, which is over 100 times larger than our own Milky Way’s rate. This high rate was somewhat unexpected, as galaxies at z > 7 like z8-GND-5296 are expected to have star formation rates closer to about 10 solar masses per year. Even more surprisingly, there is another galaxy forming stars at a similarly high rate in the same small survey area that z8-GND-5296 was found. The authors noted that the presence of both galaxies in a relatively small area of sky is highly unlikely and could mean that most galaxies in the early universe were forming stars at rates much higher than previously thought. Of the 43 galaxies for which the authors measured spectra, z8-GND-5296 was the only galaxy found to have strong Lyman-α emission, despite the authors expecting to have found about six such galaxies. To explain these results, the authors hypothesized that their observations may be probing the epoch in the Universe’s history when it transformed from mostly neutral to ionized hydrogen gas (an era known as reionization). Neutral hydrogen gas very effectively absorbs Lyman-α photons, and if most of the 43 observed galaxies were formed when the Universe was mostly neutral, then the Lyman-α emission from these galaxies could potentially remain hidden from observations. Thus, the abundance of distant galaxies with and without Lyman-α emission can help narrow down the exact time of reionization. These details are currently quite uncertain and are an important open question in astronomy. Further observations of high-redshift galaxies like z8-GND-5296 can potentially offer a powerful probe of the properties of the Universe during this important epoch in its history. How can this galaxy be 30 billion ly from earth when the age of the universe is 13.8 billion years? great question! The light from the galaxy was indeed emitted (13.8 billion – 700 million) years ago, but because the universe is always expanding, this doesn’t directly translate to a distance of ~13 billion light years (it would with no expansion). In fact, the expansion means that the galaxy’s distance from us today will actually be much larger than that, closer to the 30 billion light years quoted. I accept your response; I don’t understand it well, but I’ll live with it. Does this mean that in 2c! What am I missing? Thanks in advance for putting up with me. But isn’t the the most distant galaxy that has been spectroscopically confirmed at z=8.6? At least this is what is claimed by a Nature paper (http://dx.doi.org/10.1038/nature09462). Thanks for mentioning this! It seems that there has been an independent spectroscopic study of this galaxy claimed to be at z=8.6, and they were unable to reproduce the result, likely meaning it was a spurious detection. The paper can be found here: http://arxiv.org/abs/1301.4477. The authors of this work mention this result briefly in section 3.1 of the supplementary section.